To win, you must think strategically. To do so, you must understand the difference between a strategy and a plan. Many people confuse a strategy and a plan. In this issue we explore the difference between the two. Strategy is about choices which a company makes on how it will win with its customers and stakeholders against the competition. The business or organization activities can be divided into two (i) Revenue generation; (ii) Operations and project activities implementation. Revenue generation is concerned with the business model. How does the company make money? Is it sustainable? Usually, top management (tactical or middle management) and above are expected to spend over 60% of their time focusing on revenue growth and sustainability. For example, the Board and senior management team cannot rest unless revenue for the business is assured. In a football team, there are strikers, defenders and the . The focus (over 80%) of the strikers is to score as many goals.The defenders ensure that the team does not concede. And the midfielders act as a go between the strikers and defenders. That is what the business is all about. At tactical level or middle management level, these act like the midfielders. Their role is to link the top leadership and the operations. They are a go between. The operations execute the work plan. They act like the defense. Their work is to ensure value for money or cost management. The most action takes place here. A good strategy should be clear on how the business will generate revenue. And where growth will come from in future. What must be done? As shown above, strategy is about envisioning the future organization how it will be in terms of technology, growth, facilities, brand visibility etc. and asking what changes must be made now to ensure the future organization is attained. 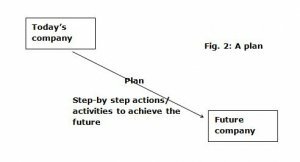 A plan, on the other hand, provides clarity of the step by step activities to achieve the strategy. Other people call it a work plan, business plan or strategic action plan. Regardless of the name, a plan provides clarity of the actions in a step by step approach of achieving the strategy. Therefore, you cannot have a plan unless you have a strategy. 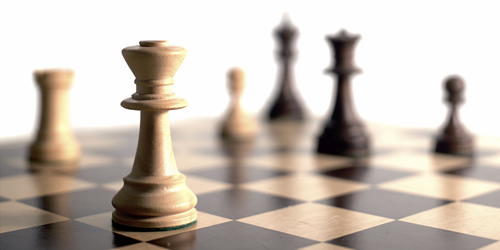 The strategy (choices for the business) is a responsibility of the Board. Once the Board provides the strategy, the management, represented by the CEO and or MD, must then develop a plan showing clearly how the strategy will be achieved. Once the Board is happy with the plan, they can then approve it. That is how a strategy and plan relate.